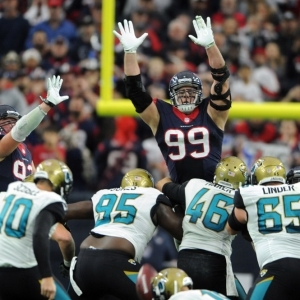 Houston (-5.5) vs. Jacksonville: At this point we don't know if this game will be played in Houston, though there is obviously a good chance it won't be. And we don't know for sure which QB will be starting this game for the Texans. But it just doesn't matter. Wherever the Texans play they are going to be playing for a city that has been devastated, and that emotion will fuel them. And that doesn't even really matter, because this defense is very well equipped to make life truly miserable for the horrible excuse for an NFL quarterback that the Jaguars will be fielding. I have concerns about Bill O'Brien as an NFL coach, but surely even he can't screw this up. When the better team has far more motivation and support there is no reason they shouldn't win - and any number less than a touchdown in this circumstance is certainly fair. Tampa Bay (-2.5) at Miami: I am not nearly as down on Jay Cutler as many are - no one was going to be good on that team last year, and the year before he was quite solid. But I would have picked the Bucs even if the Dolphins were at full strength. Tampa Bay is not only a legitimate playoff contender, but it says here that they are going to win their division. They are talented and would have had the edge at QB regardless of who the Dolphins fielded. Tampa knows that this is a big year for them, and making a statement against an in-state rival to open the season is a good way to let people know they are serious. Road favorites are often scary, but this is less than a field goal, so it is less concerning than it could be. The Bucs are a comfortable play from where I'm sitting. Green Bay (-3) vs. Seattle: I keep hearing that this is a different Seattle team this year, but I will believe it when I see it. The last couple of years they haven't been all in mentally, and it has really impacted their swagger, and therefore their results - especially early in the season. The core is largely the same, so expecting something different at the very least makes me nervous. Green Bay is very talented, Aaron Rodgers is ready for a massive year, and they are very tough at home. They have high expectations this year, and they are surely going to be fired up to get out of the gate with a bang. Giving up only the home field advantage while taking the better and easier to trust team at home is something I am very happy to do. Tennessee (-2) vs. Oakland: This is so tough - a very good Oakland team against a Tennessee team that is very reminiscent of where Oakland was at this time last year. The Titans have a great offensive line, a QB who is already proven and should take a big step forward in year three, and solid talent throughout. Oakland has many of the same things, though, and are more battle-tested since their climb into the top ranks of the league started a year earlier. I can make a case for both teams and see no edge in this line. Minnesota (-3.5) vs. New Orleans: The Vikings are going to be determined to make sure Adrian Peterson doesn't have a big day, but the running back will be hungry to prove the team gave up on him too soon. Who has the edge there? The Saints aren't likely to be robust defensively, but the Vikings have real questions at QB. Who has the edge there? Drew Brees throws for 5,000 yards a year in his sleep, but he's 38 and isn't going to be strong forever. Can he be trusted in this spot? I could go on and on, but the point is that there are far more questions than answers, and that makes for an uneasy bet. Philadelphia (-1.5) at Washington: What's Carson Wentz going to be this year? And why don't the Redskins trust Kirk Cousins when it seems obvious they should? Differentiating between these two teams in the NFC East race is very tough - Philadelphia likely has more talent but also more questions at QB. So, playing in Washington creates, at this price, a mess that I just can't deal with.